I'm finally through with the backlog of reviews from the "apartment days," and it's time to start posting new reviews. To kick things off, I wanted to do something a little special. 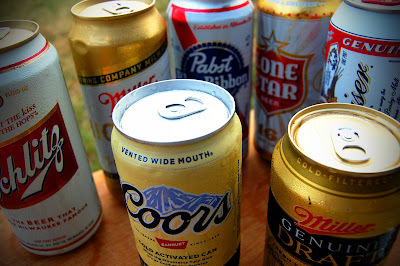 A couple years back, I posted a roundup of Light Lagers as part of The Session #25. It was all a lot of fun, so I wanted to give it a whirl again with their "non-light" counterparts as the first batch of reviews at the new digs. This time though, I wanted to go all out. With that in mind, I assembled a super team—not dissimilar to the A-Team—of American Adjunct Lagers. Of course, the big three of BMC got the invite this time, sending the first-stringers Budweiser, Coors Banquet, and Miller Genuine Draft. And I had to invite back the regional favorite too, so Lone Star is in. To make things a little more interesting, I wanted to include some classics, so Miller High Life, Schlitz, and Pabst Blue Ribbon all got the call. 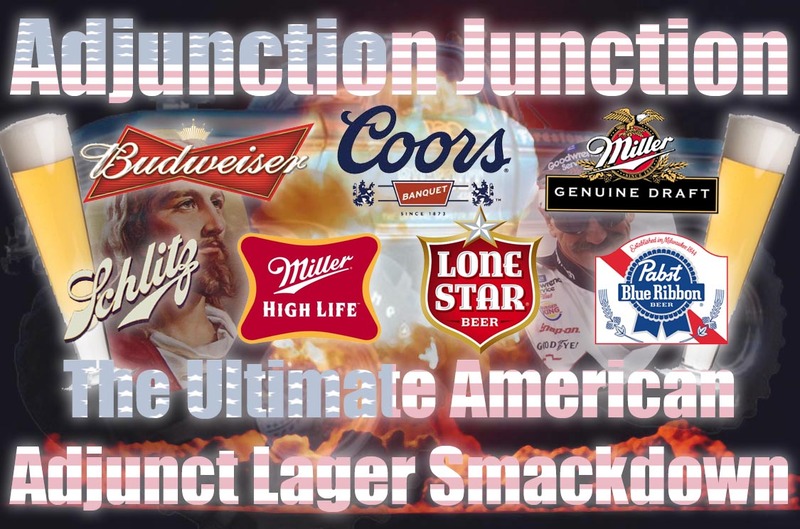 All together, that makes seven different American Adjunct Lagers, a team representing the most popular beers in the style. You may think I'm crazy for embarking on this journey, but remember I do it all for you, loyal readers. I do it for you. Buying them all was a lot of fun. I was able to buy two single 16 ounce cans each of Bud, High Life, and Lone Star, but had to resort to six-packs of Schlitz and PBR. Despite visiting many "beer caves" at liquor stores, grocery stores, and gas stations in the Houston area, I was unable to find big cans of Coors or MGD, eventually settling on twelve-packs of 12 ounce cans. If you're keeping score, that's 42 cans (or four and a half gallons) of American Adjunct Lager that were acquired for this shootout. Just a quick note on methodology. Reviewing seven different beers at once is never an easy task, especially seven different beers in the same style (double especially if it's such a bland style). Also, I find it hard to write anything that even comes close to making sense after seven beers. With all of that in mind, I took photos, wrote tasting notes, and assigned a grade to each beer separately over the course of a couple weeks. Once all of the beers were done, I sat down with a sample of each beer to compare them against each other to further tweak the notes and verify the relative ranks. Truly, the best of both worlds! I don't really have a clever hypothesis, question, or even point here, this is just for shits and giggles. Let's dig in! Budweiser is the best selling version of this style, making it the perfect place to get started. Supposedly the king of beers, Budweiser has virtually become shorthand for American beer all across the world. Unfortunately, it's watery, sweet, and about as bland as a slice of American cheese, making it a rather dreadful ambassador. 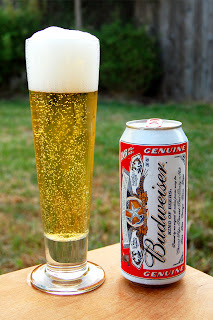 You can read my full Budweiser review here. Second up to bat is Miller Genuine Draft (MGD). Originally conceived as a way of emulating draft High Life at home, MGD is not pasteurized, but rapidly chilled and then cold-filtered. MGD has become the flagship for Miller, despite only existing for a scant quarter of a century. For the style, it actually has a pretty robust malt profile, but it still doesn't measure up to the original High Life for me. You can read my full MGD review here. Representing the last of the big three is Coors Banquet. The beer that launched the Coors empire back in 1873, Coors is a Rocky Mountain original that still leans heavily on the region for its image. It's a well-balanced beer, but ultimately pretty boring. Rather surprising, as it's little brother Coors Light won my light lager challenge. You can read my full Coors Banquet review here. Representing the local contingent is Lone Star Beer. Lone Star, founded by Adolphus Busch, was the first modern brewery in the state. Today though, the beers are brewed by contract. Like Budweiser, the "National Beer of Texas" is a poor ambassador for its region. It's maltier than most of the beers here, but rather faceless and forgettable. 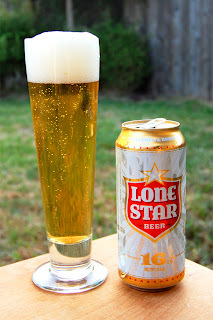 You can read my full Lone Star review here. Kicking off the retro brews is Schlitz. Not just fun to say, Schlitz used to be one of the dominant names in brewing. There's a 60's formulation version available now, but this is the budget beer version that's kept the brand limping along over the last few decades. It's rather standard for the style, with a nasty metallic twang. 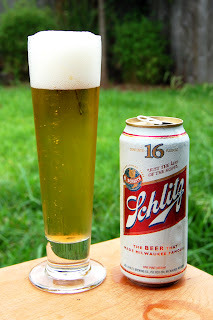 You can read my full Schlitz review here. Next up for the old-schoolers is Miller High Life. Know as "the champagne of beers," High Life dates back to 1903 and was one of the first premium beers in America. These days, it's not quite at the top of the market, but I still quite like it. There's a good mix of grainy malt and lemony hops making it crisp and refreshing without the crushing boringness found in many of the beers here. 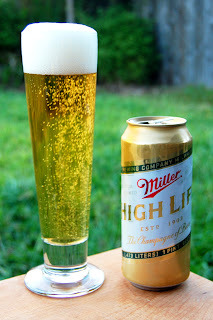 You can read my full Miller High Life review here. 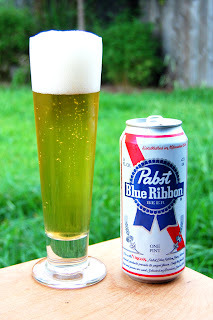 Wrapping things up for the throw-backs the hipster favorite Pabst Blue Ribbon (PBR). Pabst is another fallen juggernaut that's been rescued with the new interest in old beers. The flavor profile is malt-heavy, with a slight metallic taste that doesn't ruin the party. The hipsters may be on to something, as PBR brings more character than the big guns. You can read my full PBR review here. In sixth place, Coors Banquet. 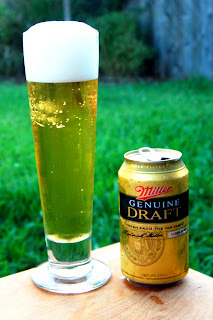 In fourth place, Miller Genuine Draft (MGD). In third place, Lone Star Beer. In second place, Pabst Blue Ribbon (PBR). In first place, Miller High Life. Anyway, so what have we learned today? Well, nothing really, I suppose. None of these beers are particularly "good," but hey, at least the world now finally knows my preference in American Adjunct Lagers. I know that's been bugging you, world. You want to know a secret? Sometimes I buy a sixer of High Life. Not only is it handy to have around for guests, but sometimes it's just what I'm in the mood for. Sometimes I just want something crisp and refreshing when I get home from work or when I'm grilling up some burgers. I know a lot of us in the beer world get snobby about these beers, but they have their place. No Milwaukee Best reviewed? The beast is some pretty rough stuff. I'm sure I'll get to that alongside some other of the budget heroes one of these days. Narragansett Lager, representing New England and lil' Rhode Island, has all these beat!